Fig. 1: 6½ Digit benchtop multimeter. To determine the voltage difference, also called the potential difference, various types of instruments are available. 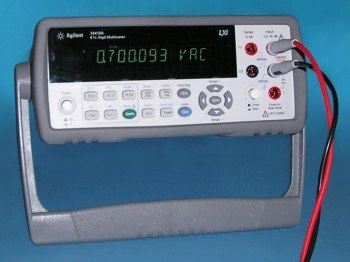 The multimeter, or avo-meter, is the most used instrument for this task. To make the voltage variation over time visible the oscilloscope most often used. A simple quick connection of a voltmeter to the two points whose potential difference must be known will in most cases give a sufficient result. However, if a result is needed with the greatest accuracy, there must be paid more attention to the measurement. The reason of the voltage measurement is also important. If the average or RMS value must be measured is explained in the article Theory & Definitions. Information about measurement uncertainties caused by the tolerances of the used instrument can be find in the article Accuracy, precision & resolution. In addition errors can occur by thermo-electric voltages, external fields etc., described in the article Measurement errors. A measurement result is very depending of the multimeter model being used. Independent from the specified tolerances, significant measurement errors could arise by the manner how the meter the voltage signal processes. Therefore, watch closely to the limitations of the instrument to be sure that the measured value is valid. The kinds of faults that can occur are described in the article Multimeters: measurement deviation. If the voltage source to be measured has a high output impedance or the input impedance of the voltmeter is small, non-acceptable measurement errors could occur. Fig. 2: A voltmeter measures a lower voltage than the source voltage due to several impedances in the system. Figure 2 shows a measurement setup where the voltage of a source Vsource with an internal resistance Ri is measured. The voltmeter has an input impedance Zm that load the source and causes a current Im to flow. The internal resistance of the source, together with the meter impedance creates a voltage divider. Therefore a lower voltage is measured than the original source voltage. In this example the measurement error is 0,1 %. The result can be improved by using an instrument with a larger load impedance. Good quality benchtop multimeters have the option to switch from the normal impedance of 10 MΩ to a much higher impedance. In the example above is assumed that the impedance of the voltmeter is ohmic. If high frequency signals being measured, also the inductive and capacitive reactance must be taken into account. An oscilloscope probe with an ohmic resistance of 1 MΩ and a parallel capacitance of 45 pF at a frequency of 1 MHz will have an impedance of only 3,5 kΩ. This is a significant load for the voltage source. More over the frequency dependent impedance in the article Oscilloscope probes. Fig. 3: The measure location will influence the measurement accuracy. The place where the voltage is being measured is of great importance. This must be taken place as close as possible to the point whereof the voltage must be known. This is especially important in circuits where large currents are flowing and the voltage drop across cables and junctions have a big influence. For example: If the source voltage must be measured, than must the measurement take place at the terminals of the power supply (voltmeter V1). If the voltage is measured at the load, than the voltmeter, in this case V2, will show a lower voltage. This is caused by the voltage drop across the connecting wires and terminal resistances Rx and the current I flowing through it. A measurement close to the source isn't influences by these connecting resistances. Also the opposite is true. If the load voltage must be known, then the measurement must be taken as close as possible to the load (voltmeter V2). How further away from the load how higher the voltage that is measured.